Lord Of The Rings by J.R.R.Tolkien. 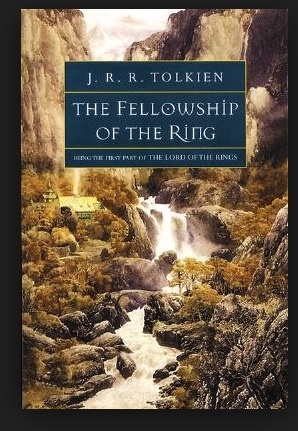 A fantasy book set in an ancient possibly ‘imaginary’ or alternative time frame, before even history was recorded, many say Middle Earth was Tolkien’s view on the Earth’s creation and it’s ancient history. This Lord Of The Rings is set around 60 years or so after ‘The Hobbit’, which is sort of a prologue to the Lord Of The Rings and apparently for a younger audience! The main character in the Lord Of The Rings is Frodo (Bilbo’s heir, Bilbo being the protagonist in The Hobbit). Bilbo is celebrating his ‘eleventy first’ (111) birthday when the story begins, and he puts a massive party to celebrate the occasion but, Bilbo didn’t gather every one just for this one reason. He had another less obvious motive. He wanted to say his last goodbyes, before leaving The Shire and middle Earth behind. The One Ring ,which Bilbo found in the caves in the goblin mines, in the prequel The Hobbit isn’t actually as innocent as it first appeared to be. The Ring in question is an ancient relic from a forgotten time, bursting with dark power. If you, the wearer were to hold the ring for long enough you would slowly fade away and that’s just by holding the thing. Imagine what it could be capable of in the wrong hands, if you were capable of wielding this power. When an evil power begins to rise once again, many feel The One Ring must be destroyed at any cost before it’s too late. Teen Rating: A type of book that’s almost impossible to find anymore these days. 5/5. 13+.